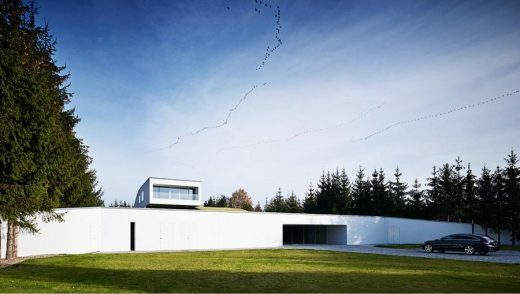 The Auto-Family House was nominated to the European Union Prize for Contemporary Architecture – Mies van der Rohe Award 2013 – the 6th nomination for the Polish architecture office of KWK PROMES. Previously honoured projects: Aatrial House, OUTrial House, Komoda House, Broken House and Safe House. The only access to the plot is from the south, effecting in a conflict between the driveway and the garden to be designed. Therefore, the garden and the house is elevated to the level +1 while the entrance stays at the level 0. For the inhabitants comfort the driveway leads them to the garden, creating easy connection between two floors. To preserve the garden intimacy, that could be disturbed with an entrance, the driveway was covered with green roof and walls. As a result the created tunnel rises up into the garden and becomes the house. 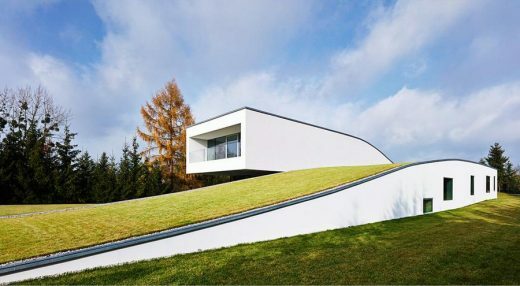 The house owner is an art collector, and this inspired the idea of joining together these volumes: the entrance, the driveway and his gallery of paintings located in the tunnel. Therefore, the living space expanded after adding the driveway and the car is now an integral part of the interior. Nowadays the houses are located in the suburbs and the outskirts of the city. Thus, the car plays a significant role as a main transport. As a result, we enter the house driving in through the garage and the main entrance is hardly used. In Autofamily House the garage, a typical part of the ‘unclean’ zone, is now the representative entrance-driveway section. Therefore, a new typology of a family house is defined by joined entrance and driveway that now is a part of the clean zone. The moment of driving in the garage becomes a pleasant experience. Thanks to this solution and today’s technology, the car is getting more and more important as it improves the quality and comfort of life, while being an excellent element of interior design.